Lately I have been on a Vegan/Vegetarian kick that is surprising me, not just for the meatless fare that I have been partaking, but also the flavors and the sense of satisfaction that the meals have imparted on me. 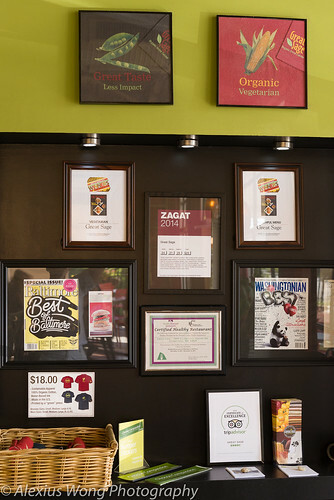 For some time, many of my acquaintances have been mentioning about a vegan restaurant in Clarksville, near Columbia, MD. Being out of my blogging area, I wouldn’t have considered writing about the place. But with so many accolades that it has garnered, I decided to pay it a couple of visits before penning about the establishment. Driving to Great Sage is relatively easy since it is not too far from the Route 32 that is a major thoroughfare of that part of the boonies. 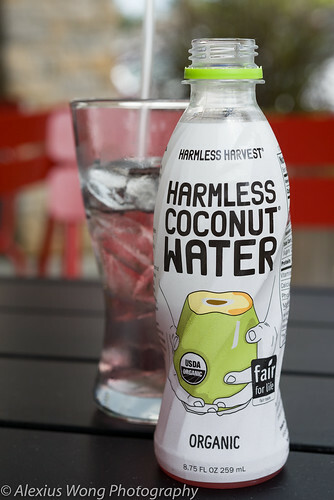 Located in a strip mall, it sits at the end of the parking lot dotted by other vegan and New Age establishments. We decided to sit in its outdoor area so that I could get some good light for the photos. 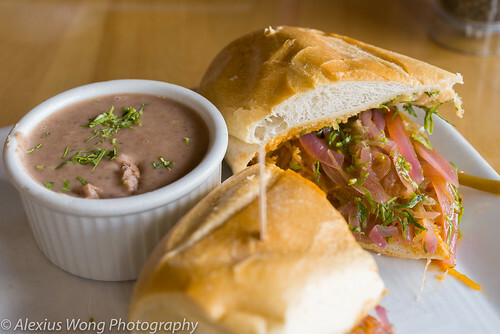 Looking through its rather simple menu, we picked out a couple of openers. I started with the Pink Peppercorn Beet Salad. The plate landed with a melange of colors and shapes. 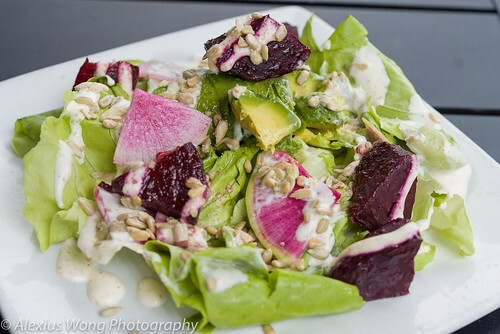 The bed consisted of Boston lettuce, topped with large pieces of beet (tasting mild from being boiled), pieces of colorful and crunchy watermelon radish, a ravishingly ripe avocado, all garnished by some sunflower seeds made savory by a sugar-salt mix, and drizzled with a “creamy” pink peppercorn dressing (vegan – really?). I was impressed by this fresh combination and flavors that just hit the right spots. 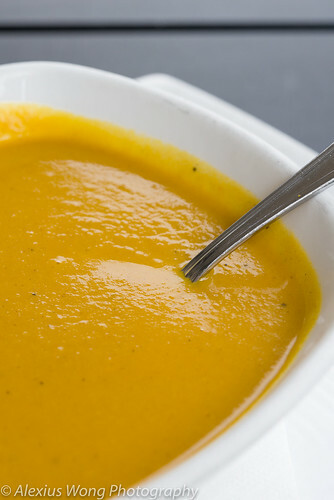 My BFF’s Carrot Ginger soup was quite tasty from the spice root’s zing quality and slight sweetness from the carrot, with a faint background note of fenugreek, which is a departure from the usual cumin. However, I thought it lacked a bit more body and sweetness, thus left me wanting more in this dish. 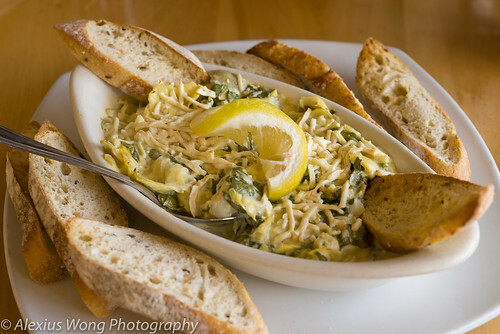 On another occasion, we went for the houses signature appetizer – Spinach Artichoke Dip. The rather big platter arrived with some toasted whole wheat baguette, which beckoned our hungry stomachs for an immediate tasting. Boy, was it good! The baby spinach were barely wilted without the bitter aftertaste, the pickled artichoke chunky and lending its vinegary quality to the whole mix, and the dressing and “parmesan” topping tasting so creamy that they fooled my taste buds that the dish was purely vegan. Now with a healthier version like this, I could eat this dish more often, or serve it at parties without anyone noticing the difference. On to the main courses. BFF ordered something usually found in Korean restaurants, but made vegan here – Bibimbap. 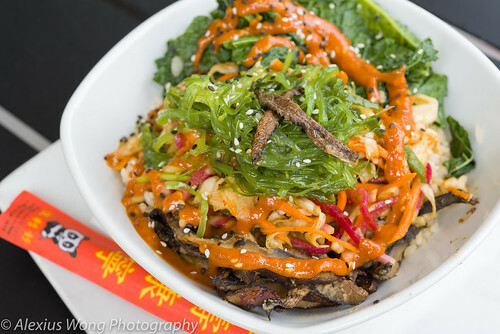 The bowl arrived with brown rice as its base, topped with strips of Portobello mushroom sautéed with ginger, pickled red ginger, carrots, cabbage, sweet and tangy Wakame seaweed salad, young kale leaves, and white and black sesame seeds. This meal was quite hearty and very tasty according to him, but he was breaking out into sweats with the fiery Sriracha/Hoisin sauce, which could have been served on the side. 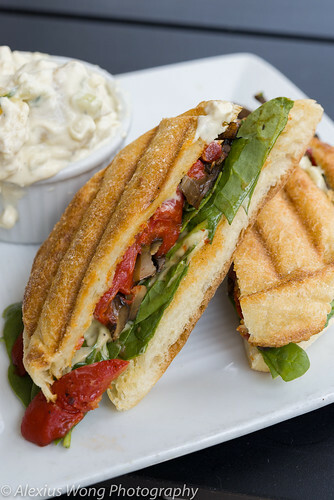 My order was in the Mediterranean vein – Portobello Panini. The focaccia bread had hints of rosemary, reminding me of the ones I had in Italy. The stuffing was grilled portobello that tasting tangy from a vinaigrette marinade, fresh young spinach leaves, and sweet roasted red peppers. Its tangy note was coupled by a creamy tangy dressing. However, it was the side potato salad that got most of my attention with the textural contrast of potato and celery enveloped by a “creamy” tangy dressing that belied its vegan nature. I had to try its desserts since that is an area that can be tricky with the lack of egg and butter in vegan cooking. 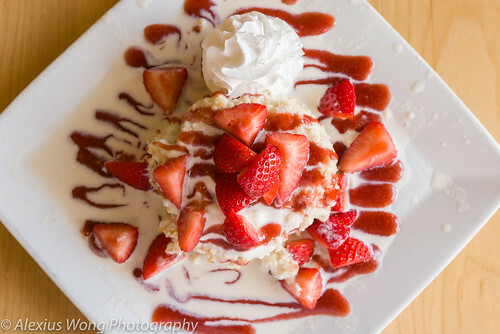 We ordered the Sin Tres Leches, a play of words (“sin” meaning without) on the extremely creamy and rich (and calorie-laden) original version. The plate arrived slightly messier than what I expected but all the elements looked very tempting. The pieces of strawberry were fresh and quite sweet, echoed by the rather sweet strawberry coulis that was proper. However, the cake was a bit off due to the use of unbleached flour and the lack of the non-vegan elements that would have added some more body to it; the use of some decent amount vanilla would have helped it too. The “creamy” sauce didn’t hit it for me, it being made with coconut milk, soy milk, and cashew milk, which didn’t add enough richness to the mix. The side of “whipped cream” tasted of just trapped air which perplexed me with its “nothingness”! Maybe another dessert dish would have been successful with its vegan rendition. Vegan cooking can be very tricky due to its effort in replicating flavors and textures found in non-vegan versions. What Great Sage falls short on are on the dishes that pretty much fall in the domain of meat and dairy desserts. But what it does best are in those that lean heavily in the vegetarian department. 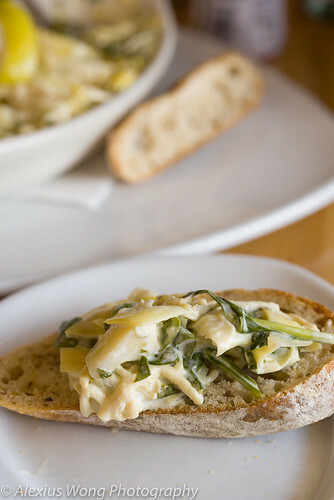 Such was the case in the Pink Peppercorn Salad, the Spinach Artichoke Dip, the Bibimbap, and the Portobello Panini. 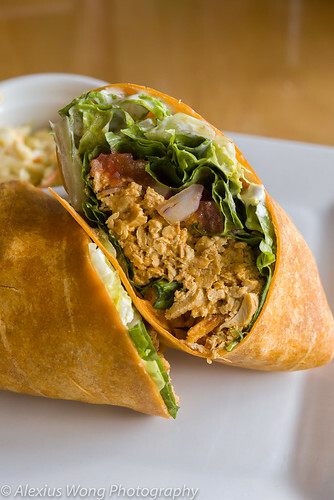 But, I have to admit that I was satisfied by the Buffalo “Chicken” Wrap which nearly caught all the textures and flavors associated with that dish. 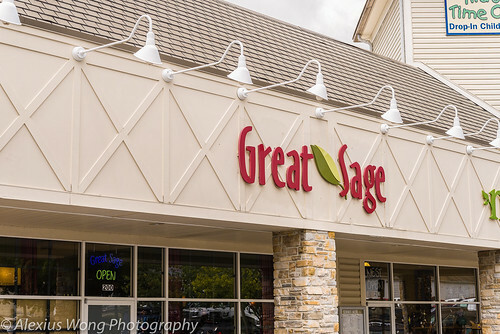 The cooking at Great Sage is not short on creativity and flavors, especially the ability to produce creamy dishes with no cream or egg. Now, I understand why they have garnered so many accolades, not only from their customers but also from the press. This is a place that I will be heading back often, especially with my vegan BFF.